Rarely has a foreign policy event spawned such interest in international public opinion as has the Iraq War. Unfortunately, due to sales rights restrictions, we cannot offer Public Opinion and International Intervention for sale in your country. Rarely has a foreign policy event spawned such interest in international public opinion as has the Iraq War. What does this war indicate about the extent to which public opinion influences foreign policy leaders? Have leaders' decisions about participating in the Iraq Coalition reflected the willingness of their citizens to do so? Are leaders of some countries more responsive to public opinion than others? The editors address these questions using select case studies that explore the extent to which leaders and people in democracies that are capable of participating in the Iraq War Coalition have willingly done so. 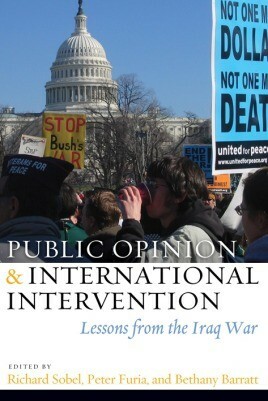 Each chapter is based on the premise that democracies are most responsive to public opinion and that the wealthiest democracies would be most capable, though not necessarily most willing, to participate in the Iraq War. The editors have assembled contributions that build on the successful model of Richard Sobel's International Public Opinion and the Bosnia Crisis. In this Iraq volume, leading scholars debate the role of public opinion in particular countries'decisions to participate—or not—in an international conflict, making it an essential text for any foreign policy course.